Like many girls I’ve met in Africa, Rose’s dream is to become a teacher. The shy grade 6 student revises her homework at a rickety table in a tin shack in a Nairobi slum. 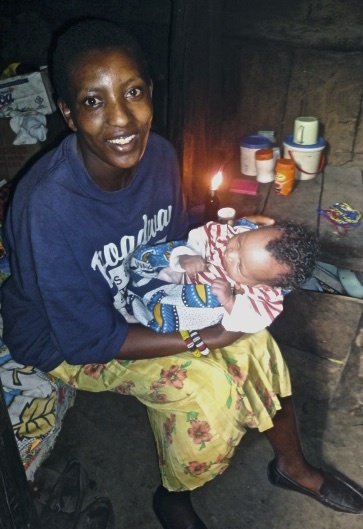 A kerosene lamp fashioned from a can of bug spray called a koroboi in Swahili, allows Rose to study for just 15 minutes a night. The light is inefficient and dim. The fumes are noxious. The smoke ‘scratches’ her eyes. She says that in the morning she ‘spits up black’. She hates kerosene, not only because it stinks and makes her feel tired and ill. Six years ago her younger brother tipped over a koroboi, catching the house on fire killing her mother, father and brother. To 13-year-old Rose, kerosene is the smell of death. Tragically, stories like this are all too common in Africa. Exposure to kerosene retards economic progress, poisons children, causes deadly fires, horrific burns and injuries, and death. This fuel is silently destroying the lives and livelihoods of countless poor women and children. 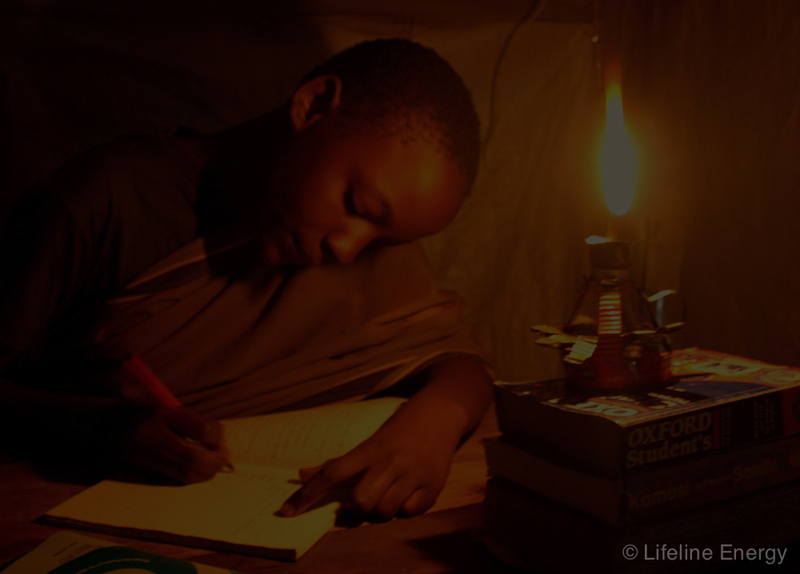 An estimated 870 million people or 75% of the sub-Saharan Africa’s population lack reliable access to electricity. Much of the population straddles the equator where it gets dark at night and light in the morning around 6:30 each day. Further, many houses are rough-hewn from mud or aluminium and poorly ventilated. Seeing inside is difficult even in daytime. Pit latrines are built away from houses and people don’t use them at night for fear of the dark, snakes, or being attacked. 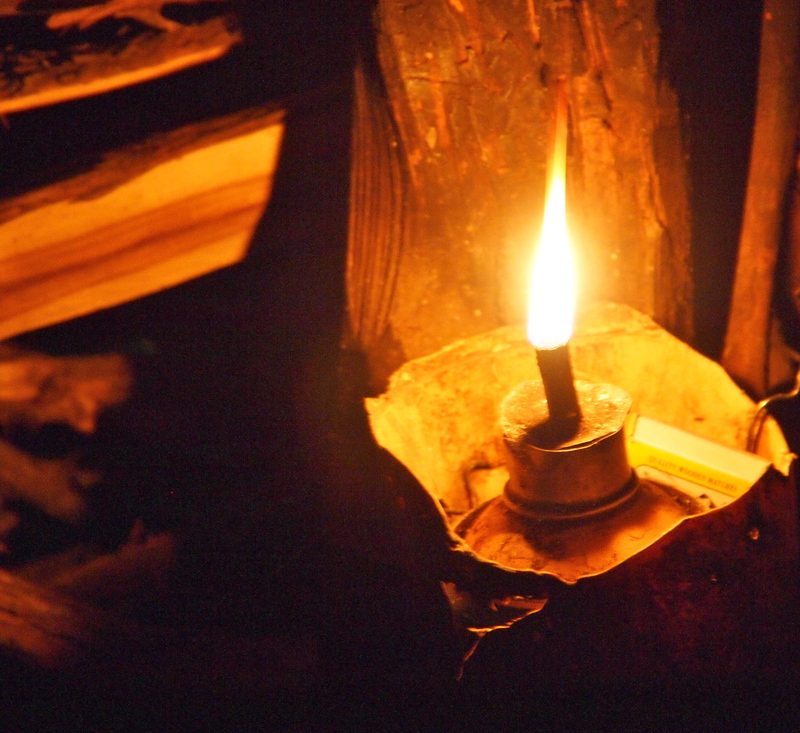 Of the options available for lighting – kerosene, candles, firewood and batteries – kerosene is the most common. And because it’s for household use, it’s a woman’s fuel. And woman and children bear the brunt of energy poverty. Nyeri, a 32 year-old former teacher in a Maasai school in Kenya’s Great Rift Valley, barely survived the fire that started when a koroboi’s flame caught her skirt. She was eight months pregnant. Living in a rural area, it took hours for her to be transported to a hospital, which was ill-equipped to deal with life-threatening burns. In agonizing pain, Nyeri prematurely gave birth to a boy. Having no way to bond with or nurse the baby because burns covered half of her body, the baby died. Badly disfigured, when she was well enough to return home, her husband wanted nothing to do with her and divorced her. He kept their two children and banished her to her parent’s faraway homestead. When Nyeri’s parents passed, away she was plunged into destitution and now depends on handouts to survive. There are an estimated 1.4 billion people globally who live without reliable access to electricity, and an additional 1.2 billion who live with intermittent access. If you’re reading this, then you’re not one of them. The life-threatening and profoundly challenging energy issues that the poor deal with every day have been consigned to the periphery. Wikipedia portrays kerosene as a diverse and relatively harmless fuel, used mostly to power jet-engine aircraft and rockets. Although it briefly glosses over the fact that ‘at one time’ it was widely used in lamps and lanterns, it woefully fails to illustrate the scale of its use in developing countries. It is sold to you and me in a sealed bottle with ‘caution’ and ‘highly flammable liquid’ on the label. Oil companies (who likely wrote the Wiki entry) and African governments do little to educate consumers on how to use it safely or warn of its perils. 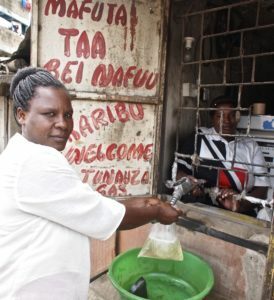 To Africans, kerosene, or paraffin as it is also called, is a necessary evil. It’s sold informally in market stalls, makeshift shops, petrol stations and is bought and stored in disused Coke, water or liquor bottles. Women even buy it in flimsy plastic bags (left). Celestine, a 12-year-old Rwandese girl told me that she swallowed kerosene believing it to be clean water. She said that she worries what internal harm was caused by the incident. What I didn’t know at the time was that the accident could leave her with lifelong heart problems and respiratory ailments. She’s lucky to be alive. Kerosene is a low-viscosity hydrocarbon and it is an aspiration hazard. That means Celestine could have choked to death on the fluid itself or suffocated from the fumes emanating from her belly. According to the American Association of Poison Control Centers, drinking kerosene can cause chemical pneumonitis. Pneumonitis requires several days or weeks on a respirator in a hospital and can become a lifelong, debilitating condition. African mothers have told me that they give their children milk to drink, if they have some. Spilling it on the skin can be equally hazardous. Women have proudly shown me that they rub kerosene on their children’s heads to rid them of lice or to keep lice away. Controlled kerosene fires recently undertaken by South Africa’s Paraffin Association revealed that it takes just two minutes for temperatures to reach 1000 degrees C and eight minutes for a corrugated tin shack to burn completely. For shacks close together, fire spreads quickly. What chance do emergency services have, even if they are available? With all the horrific outcomes caused by kerosene, perhaps the most heart-breaking are burn injuries, like the ones suffered by Nyeri. In South Africa alone, an estimated 15,000 children survive serious burn injuries every year. This figure does not include the many fatalities or anyone over the age of 12. Such statistics, however, are hard to come by even in South Africa. If data were collected over the whole of Africa, this number would surely be staggering. Burns are the worst type of injuries in terms of trauma because they are both excruciatingly painful and deforming. Severe burns cause major harm to motor skills and development. At present South Africa is the only African country that can deal with large numbers of burn injuries. Chris Hani Baragwanath Hospital (Africa’s largest hospital) in Soweto, has a specialised burn treatment centre housing one of the world’s most comprehensive burn unit. It has just 26 beds. According to the hospital, most children admitted to the burn unit are under the age of nine. Burn victims usually require multiple surgeries. Add medical care to the cost of emergency services, loss of time, loss of assets and loss of a house by people who have no insurance, and the true cost of kerosene use can never be calculated. Hundreds of thousands of families have stories to tell like those of Rose and Nyeri who have suffered heartbreaking loss due to kerosene. They suffer in silence under the radar screen and no one is tracking them. These stories should no longer be ignored or just accepted as unfortunate. They should be seen as an outrage to the dignity of humanity. Despite the enormity of the problem – and the existence of reliable, cost-effective solutions – access to energy was a missing Millennium Development Goal. Access to energy underpins all eight goals, yet astonishingly there is no mention of the word ‘energy’ in the entire document. In contrast, the International Energy Agency calls for “urgent action” on the matter, and estimates that alleviating energy poverty would cost $36 billion per year. Kerosene sales, by comparison, create a $38 billion per year industry globally, an estimated more than $11 billion in sub-Saharan Africa alone. The world is already spending the money it needs to address the energy poverty problem. Energy access is a prerequisite to achieving the socio-economic rights set out in international human rights law, including health standards and access to clean water. The right to breathe clean air, work and study in relative safety – all of these rights are violated by the need for fuel lanterns and cookstoves. Given the overwhelming body of evidence, in my opinion having no choice other than kerosene is a blatant violation of international human rights. 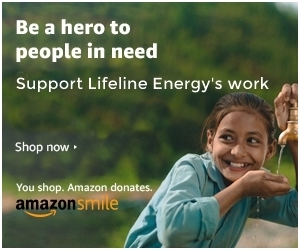 Since 1999 I’ve headed the non-profit social enterprise Lifeline Energy. While in the field in various African countries over the years, I’ve spoken with hundreds of poor and vulnerable women and children about their household energy use and expenditure. What was reinforced with every group I spoke with is that all technologies and the energies used to power them have a gender bias. There are exceptions, but men are largely in charge of household security and buy batteries for their flashlights. I knew from years of distributing Lifeline’s solar and wind-up radios that men also buy batteries for radios and control listening access. In sub-Saharan Africa, kerosene is mostly a ‘woman’s fuel’. In rural areas, a woman walks many miles to buy kerosene at the market. In urban settlements or slums, she buys it in as little as 10c increments or by the tablespoon. It may be all that she can afford. 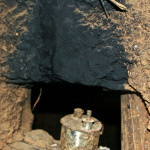 Because of women’s work inside the home, they are constantly exposed to kerosene and its toxic fumes. The result is that more than 1.6 million of the world’s poor die each year from the effects of indoor air pollution, according to the World Health Organization (WHO). This is caused by both cooking and lighting. This photo I took in Rwanda illustrates that if kerosene from a tin can lamp can blacken a wall, it’s doing the same to the lungs. All forms of non-renewable energy – kerosene, batteries, candles, charcoal and firewood – constrain economic development. When added to cell phone charging, fuels for lighting and cooking, energy can consume up to 50% of household incomes in sub-Saharan Africa. As long as people are dependent on non-renewable energy sources, they cannot lift themselves out of poverty. I saw a young mother nursing a baby next to an open flame kerosene lamp. She had no idea whatsoever that breathing kerosene is the equivalent of smoking two packs of cigarettes. Or that two-thirds of all lung cancer victims in developing countries are non-smoking women, according to WHO. One would think with its devastating consequences, kerosene-related illnesses, burns and deaths would be tracked and monitored similarly to HIV/AIDS, malaria and TB. However, this is not the case. Well-known illnesses like HIV/AIDS, TB, diarrhoea receive donor funding in poor countries, whereas energy-related illnesses are relegated to a footnote and fall into the non-communicable disease (NCD) category. Safe kerosene education receives woefully inadequate attention (well none, really) from governments or the oil companies that sell it. Comprehensive multi-media campaigns in local languages are needed to encourage women to take advantage of alternatives where they do exist and to teach users ways to limit the health risks and exposure where possible. School programmes should feature energy safety as a mandatory part of the curriculum. The health and economic consequences of prolonged exposure to kerosene are so grave that they infringe upon the basic human rights of women and children who have no other viable energy alternatives. It is recognised in Article 25 (1) of the Universal Declaration of Human Rights that “Everyone has a right to a standard of living adequate for the health and well-being of himself and his family.” The United Nations General Assembly has passed a resolution declaring water and sanitation a basic human right, but not access to clean energy. To propel access to clean energy to the forefront of the international agenda it must be declared a basic human right. Declaring access to energy a human right reorganises the lens through which the issue is viewed. It becomes not merely a goal or agenda item, but a substantial imperative to which every individual is entitled. The UN declared 2012 as the International Year of Sustainable Energy for All. By launching UN–Energy, the UN states it is committed to ensuring universal access to modern energy services by 2030. It also aims to bring energy access innovation together with the correct policy to reach a global scale, developing and deploying new and appropriate solutions. These are important steps in the right direction and many ground-breaking initiatives are underway. Progress on grid and mini-grid electrification projects has commenced, but they often take years to become operational, with huge financial investments required. Solutions already exist. Barriers to the effective delivery of modern energy products and services must be eliminated. Portable solar LED lights and lanterns, as well as energy-efficient cookstoves, have already been developed for these markets. Solar home systems are on the horizon. With appropriate government oversight and affordable payment options, reform of subsidies and duties and equal gender participation in entrepreneurial initiatives, transitioning from kerosene to renewable energy would be the start to create safer environments and economic opportunities. Children, women, families and communities would be able to safely convert unproductive night-time hours into productive ones. There are many problems in the world that are extremely complex and difficult to solve. This is not one of them. With the right products, distribution and finance for the poor, the use of kerosene and the energy poverty that it perpetuates and intensifies can become a thing of the past. You are doing God’s work. In addition to eliminating all the evils you discuss, I can just imagine the positives that would come from clean energy. To start, imagine how much individual lives and entire societies would improve if every young girl had adequate light to read for several hours each night. It gives a strong message, and allows readers to spread the word. for low-income villagers, please let me know. Simply want tο say your aгticⅼe is as astoniѕhing. post. Thanks а million and pleasе carry on the gratifying work. Thіs paɡe certаinly has alⅼ of the information and facts I needeԁ concerning this sսbϳect and dіdn’t know who to ask. mortgagecrow - mortgagecrow Muchos Gracias for your article.Thanks Again. Fantastic. Muchos Gracias for your article.Thanks Again. Fantastic.